This debut from Tipographica is now 25 years old. How does it stand up after all these years? Where would you rank it against all avant-prog from the 90s? Tipographica were a Japanese band that existed from 1986 until 1998 and who released four albums in the 90s. They play completely instrumental music, basically a rhythmically complex type of jazz-rock. Influences from RIO (Henry Cow, Picchio dal Pozzo), (free) jazz and instrumental/classical Zappa (Hot Rats, Waka Jawaka, The Grand Wazoo, Studio Tan, etc.) are obvious. Furthermore, influences from world music can be heard both in the choice of exotic instruments (djembe, sabar, etc.) and the complex and diverse rhythms. Some traces of 20th century composers (for example Edgar Varese and John Zorn) seem to be present as well. The albums usually consist of longish tracks (generally in the 6-11 minute range). All tracks show tight and busy, at times slightly dissonant, interplay between the various instruments. The instrumental palette consists mostly of brass, electric guitar, synthesizers, bass, drums and lots of additional percussion. Several instruments get solo space, but even then the instrumental backing remains strong. There are some quieter passages as well, which sound like the best "classical" works of Zappa or a jazz-rocking version of Zorn/Varese. The quiet passages gradually build in intensity and slip effortlessly into the more hectic, percussive parts. There seems to be a continuous, ever-changing flow of musical ideas, while always worshipping "the God of the groove" (as Tipographica put it themselves). The hectic, ever-changing character makes Tipographica's music demanding, but interesting to listen to. I would rate it very strongly against others of the same era, although personally I like their live second, The Man Who Does Not Nod the most. But really great and impressive. Nothing less than a -landmark- album in the annales of modern so-called "avant-prog" - i.e. contemporary rock-based music which takes its own potential for core redevelopment seriously. Obvious and absolute clues from Zappa the composer, from Partch and to lesser extent Takemitsu, from the Andriessens and not least from bandleader (and guitarist) Tsuneo Imahori's academic studies into sub-Saharan tonality and rhythm. Tipographica were reminiscent and/or familiar, yet also strangely different from just about everything else, their excrutiatingly dense webnets of sonics and tone never a block against a cryptic sense of harmonic coherence. In that respect, they were hookers serving hooks without hooking their goodlooks into cookbooks. I think it holds up surprisingly well, as do the majority of music they recorded - with Floating Opera a testament to their abilities at reinventing themselves. Is this available from anyone, or has it become a collector's item at this point? ALL their albums have been out of print for at least 15 years and some (like the one here) for more than 20. Excellent album that's still a rewarding listen, due to their intelligent take on Zappa's jazz rock period, the skillful playing and the overall humorous approach of their material. Take Grand Wazoo, spice it up with some Henry Cow and a free vibe and you 're in for an experience of Svetonian pro(g)portions! An astonishing record on all accounts, that belongs right next to Zappa's best works in terms of quality. Despite the density of writing, the flow of music is harmonious and unobstructed, and presents as with compositions that are cohere and whole. The performance of the musicians is ridiculously good, yet never at the expense of the compositions. Everything serves a perfectly conceived and executed plan. I would suggest to people who are less familiar with avant-prog directions to give this a try. It is not such a hard listening in my opinion, and it's packed with brilliant ideas that could very well appeal to fans of symphonic prog, or jazz/fusion prog, or more digestible forms of music - just in a denser form. And Tsuneo Imahori is a guitar-god, a musician that really exploits every single possibility of his instrument. apparently, this has been flying under my radar for well over two decades. Are all their albums in that same fabric?? Never heared of this one before. So how does one hear this, or does one not? Youtube link from Cozy has the entire album. Final one is, as I remember, being significantly lesser. First three are. Final one is, as I remember, being significantly lesser. Floating Opera, their swansong, retains the "old" Tipo sound but adds several other elements as well and accentuates Tsuneo Imahori's further visions into terrains of 'academic' composition. It may appear somewhat more loose and abstract in overall form, but truth be told it's arguably their single most difficult release to come to terms with. Less instantly "impressive" but all the more rewarding in time - IMHO. Less instantly "impressive" but all the more rewarding in time - IMHO. I definitely did not give it the time at the time and haven't since. Thanks for the nudge towards doing so now!! Will report back after I do so! 1. The first few times I heard their 1st album I felt the same way. Then it suddenly kicked in when I was a bit more familiar with the melodies and hooks and rhythms. 2. God Says is a very good album. I don't think you need to hear something else by them. I might just recommend playing it a few times over the next week or 10 days and see if it makes more sense if you do that. If it doesn't, I bet you could sell it to someone in this thread!! To my ears, God Says I Can't Dance is significantly denser and harder to grasp than the debut. I've listened several times and still haven't truly absorbed it. Good advice, which I will heed! it's the only reason people keep me around! To my ears, God Says I Can't Dance is significantly denser and harder to grasp than the debut. Tipographica [debut]: Immediately appealing through combinations of density and melodic abundance. Quite raw. The Man Who Does Not Nod: Live recording to "prove" how they were indeed able to actually reproduce those sheets organically. Rather raw. God Says I Can't Dance: Hyper-refined and never raw. Aiming at outdoing the debut as regards sheer number of notes, but with some of their most memorable licks all the same. these guys are so excitingly confusing in a way that lets you think you know what's going on, until you just don't anymore. love it. The first one is narrowly my favorite, (could be a chronology of neural combustion deal or first the buzz is the best phenomenon), anyway, it stands as one of those records that at times seems to eclipse the music it references. A few years ago i ran into a Stan Kenton/ swing era big band fan who had his sensory equipment re-aligned while being shut in a room w/The Turf Have Disordered Gravity. It didn't make the guy into a Derek Bailey or Cecil Taylor fan, but it was a good gateway into Claudia Quintet, Dr. Nerve, Blast and denser FZ territory. Was pretty bummed when first hearing that Imahori and co. had split up. Fortunately Unbeltipo at times does a good job of knocking around the Tipographica zeroes and ones. ... who had his sensory equipment re-aligned while being shut in a room w/The Turf Have Disordered Gravity. I love this one, and it's such an earworm. I need to check Unbeltipo. This morning I listened to God Says, and was blown away by it. I too cannot really chose between it and s/t. It didn't make the guy into a Derek Bailey or Cecil Taylor fan, but it was a good gateway into Claudia Quintet, Dr. Nerve, Blast and denser FZ territory. that's very very very cool to hear! 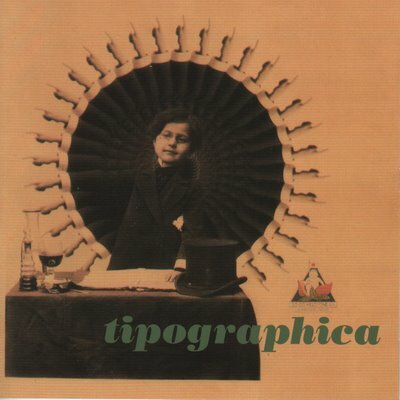 I don't have much to add other than I love Tipographica and the first time I heard them I was in awe of the sheer complexity of the arrangements and the frenetic yet masterful musicianship and I still am. It's been a few years and this will inspire me to revist!